This jelly cake is pretty and delicious – simple to make and easy to eat, leaving a really fresh taste in your mouth afterwards. What I like best about it is that it can be a really delightful addition to the menu for a child’s birthday party. Jelly that everyone can eat! No artificial colours, no chemical flavours, no animal products, no sugar. It’s a dream come true for me, and with a five-year-old’s birthday party to plan in a few weeks I know I’ll be making this again. Today was a tester for my daughter’s actual birthday. Success! It’s just real fruit, juice and water with a swoosh of maple syrup. It is set with agar agar powder, which I found in a health food store. It is a bit expensive but definitely worth it for such a special treat. The powder keeps too, but mine is quickly getting used up as I experiment with lots of fun jellies! Next, put 4 heaped tsp of agar agar powder into a jar and mix with some water. Allow this to soak while you start to bring your apple juice and water to a boil. Stir constantly and when it is boiling then reduce the heat, add the soaked agar powder and a swoosh of maple syrup then continue to cook, stirring, for another 10 minutes. I think this cooking process is what makes or breaks the agar jelly – if it isn’t cooked long enough it doesn’t set firm. Take juice/water/agar mixture away from the heat and allow to cool then pour over the arranged fruit. Cover the containers lightly and allow to cool. The mixture should set to a firm jelly at room temperature. It can also be chilled in the fridge. When set, run a knife around the edge of the dish and gently ease the jelly away. Turn the dish upside down and turn the jelly out. You can then slice it into bars. I stacked mine up like a cake and displayed it with flowers and mint from my garden. For individual serves you could set it into glasses, or little plastic containers. I set some into a plastic container with a lid for a school morning tea treat. Variations: I have made this jelly without the juice but with a bit of rosewater essence – it smelled so pretty! I put edible flowers from my garden inside and it was so delightful. Two out of three children were suspicious of eating flowers so this one wasn’t popular. 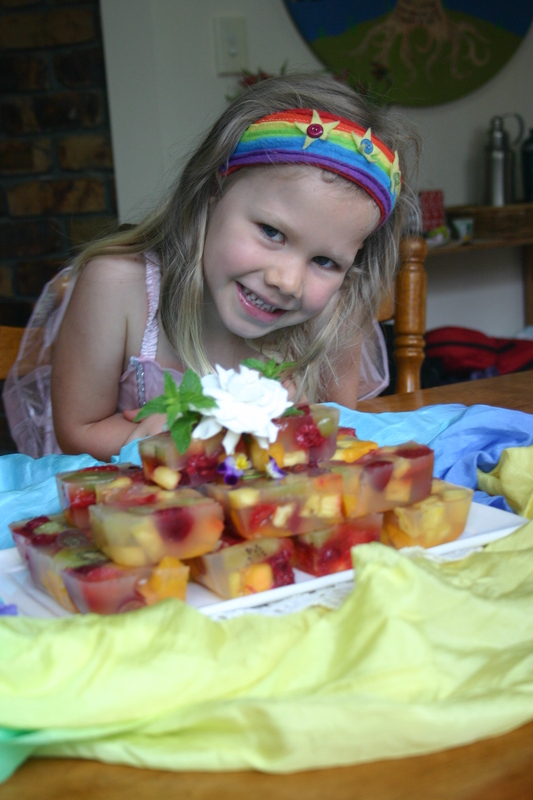 Will have to start adding flowers to our salads again so that I can make fruit and flower jelly again! 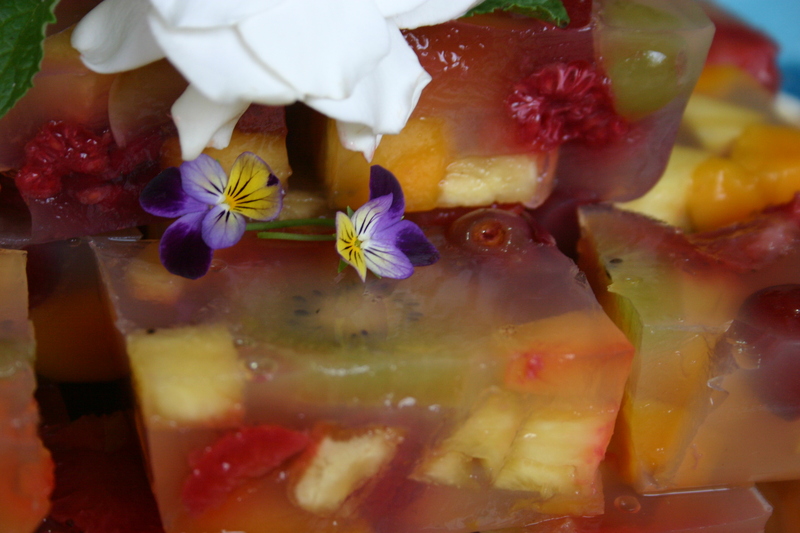 I’d also like to try it with coconut milk …white jelly and red fruit – wouldn’t that make a lovely valentines day treat?